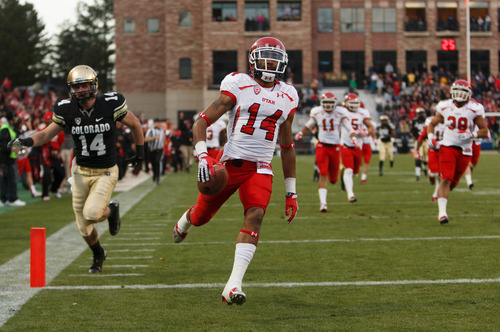 Senior's 100-yard kick return saves Utes from humiliation against one-win Buffaloes. Trent Nelson | The Salt Lake Tribune Utah Utes head coach Kyle Whittingham stands over an injured Utah Utes tight end Jake Murphy (82) after Murphy put a hard block on a Colorado player that led to a Travis Wilson (7) touchdown as the Colorado Buffaloes host the University of Utah Utes, college football Friday November 23, 2012 in Boulder. Trent Nelson | The Salt Lake Tribune Utah Utes wide receiver Reggie Dunn (14) returns a kick for a touchdown in the fourth quarter as the Colorado Buffaloes host the University of Utah Utes, college football Friday November 23, 2012 in Boulder. Trent Nelson | The Salt Lake Tribune Utah Utes wide receiver Reggie Dunn (14) returns a kick for a touchdown in the fourth quarter as the Colorado Buffaloes host the University of Utah Utes, college football Friday November 23, 2012 in Boulder. Trent Nelson | The Salt Lake Tribune Utah Utes wide receiver Reggie Dunn (14) returns a kick for a touchdown in the fourth quarter as the Colorado Buffaloes host the University of Utah Utes, college football Friday November 23, 2012 in Boulder. 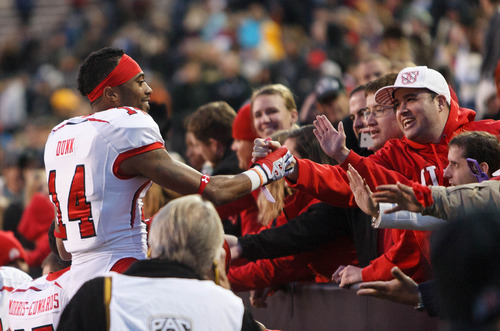 Trent Nelson | The Salt Lake Tribune Utah Utes wide receiver Reggie Dunn (14) celebrates with fans after the win as the Colorado Buffaloes host the University of Utah Utes, college football Friday November 23, 2012 in Boulder. Trent Nelson | The Salt Lake Tribune Utah Utes wide receiver Reggie Dunn (14) returns a kick for a touchdown in the fourth quarter as the Colorado Buffaloes host the University of Utah Utes, college football Friday November 23, 2012 in Boulder. Trent Nelson | The Salt Lake Tribune Utah Utes wide receiver Reggie Dunn (14) returns a kick for a touchdown in the fourth quarter as the Colorado Buffaloes host the University of Utah Utes, college football Friday November 23, 2012 in Boulder. Trent Nelson | The Salt Lake Tribune Utah Utes wide receiver Reggie Dunn (14) returns a kick for a touchdown in the fourth quarter as the Colorado Buffaloes host the University of Utah Utes, college football Friday November 23, 2012 in Boulder. Trent Nelson | The Salt Lake Tribune Utah Utes wide receiver Reggie Dunn (14) returns a kick for a touchdown in the fourth quarter as the Colorado Buffaloes host the University of Utah Utes, college football Friday November 23, 2012 in Boulder. Trent Nelson | The Salt Lake Tribune The Utah team sings "Utah Man" following the win as the Colorado Buffaloes host the University of Utah Utes, college football Friday November 23, 2012 in Boulder. Trent Nelson | The Salt Lake Tribune Utah Utes wide receiver Reggie Dunn (14) and the Utah team sings "Utah Man" following the win as the Colorado Buffaloes host the University of Utah Utes, college football Friday November 23, 2012 in Boulder. Trent Nelson | The Salt Lake Tribune Utah Utes wide receiver Reggie Dunn (14) returns a kick for a touchdown in the fourth quarter as the Colorado Buffaloes host the University of Utah Utes, college football Friday November 23, 2012 in Boulder. Trent Nelson | The Salt Lake Tribune Utah Utes wide receiver Reggie Dunn (14) celebrates his touchdown in the fourth quarter as the Colorado Buffaloes host the University of Utah Utes, college football Friday November 23, 2012 in Boulder. At left is Utah Utes tight end Dallin Rogers (89). 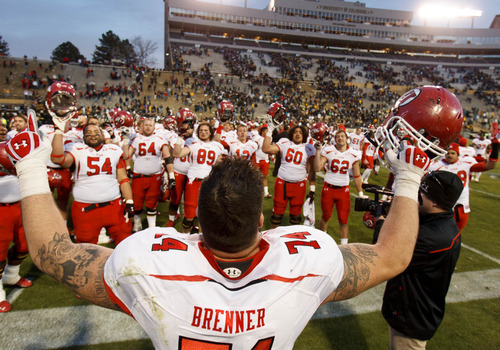 Trent Nelson | The Salt Lake Tribune Utah Utes offensive linesman Sam Brenner (74) leads the team in singing "Utah Man" following the win as the Colorado Buffaloes host the University of Utah Utes, college football Friday November 23, 2012 in Boulder. Trent Nelson | The Salt Lake Tribune Utah Utes wide receiver Reggie Dunn (14) and the Utah team sings "Utah Man" following the win as the Colorado Buffaloes host the University of Utah Utes, college football Friday November 23, 2012 in Boulder. 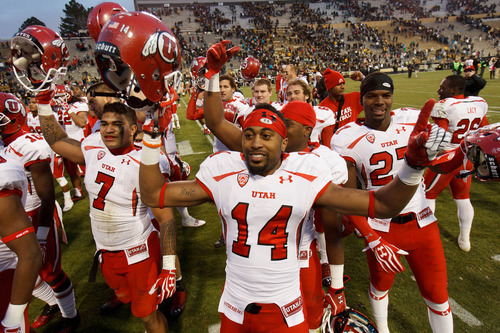 Boulder, Colo. • Utah kick returner Reggie Dunn came out of the Utes&apos; locker room Friday with his eyes bright and a huge smile on his face. "Did y&apos;all like that one better?" he asked a throng of reporters. 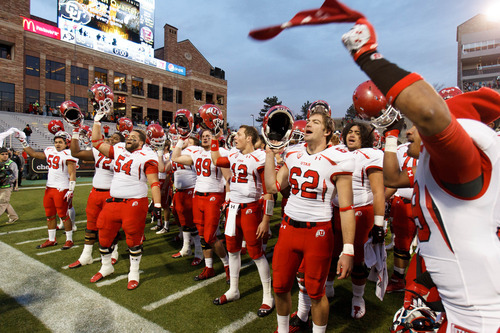 Anyone loyal to the Utes would have to answer with a resounding "yes," for so many reasons. Dunn&apos;s fourth 100-yard kickoff return of the season proved to be the difference in Utah&apos;s 42-35 win over Colorado here at Folsom Field. The play capped one of the wildest moments in college football the season has delivered, and it kept alive, however slim, Utah&apos;s chances of going to a bowl. On top of everything else, Dunn&apos;s heroics and Colorado&apos;s momentary lapse of judgement saved the Utes (5-7, 3-6) from what arguably could have been the most embarrassing loss in coach Kyle Whittingham&apos;s career. Utah&apos;s followers had to like it very much indeed. Dunn&apos;s return came seconds after Colorado&apos;s Marques Mosley had his own 100-yard return that tied the game 35-35 with 8:25 remaining. The Buffaloes (1-11, 1-8) avoided Dunn most of the day as he tried to sneak up on the kicks but couldn&apos;t get his hands on the ball, leaving Charles Henderson to return three kickoffs for 49 yards. Dunn made the one he finally nabbed count as he tucked the ball under his arm, broke through a seam and sprinted unscathed down the right sideline for the touchdown. "It was like a chess match all night," Dunn said of the return game. "They&apos;d bloop it, and then we&apos;d run up underneath it, then they&apos;d kick it deep. It was all kinds of crazy stuff going on, and we were talking about it and talking about it and I finally got a chance and got my hands on it, and everybody was ready to go." Colorado got the ball back twice but never crossed into Utah territory. 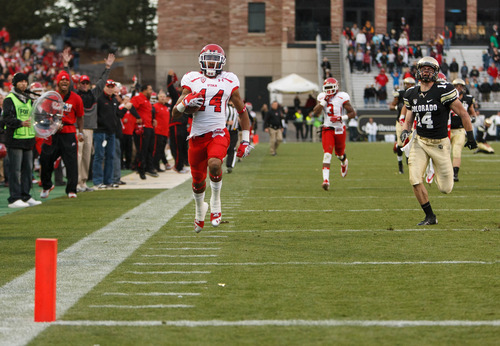 The Buffs&apos; last offensive play ended with an interception by Brian Blechen, the fourth pick of the game by the Utes. The win was a "mixed bag," for the Utes in Whittingham&apos;s estimation, as both the offense and defense struggled for much of the day. But leave it to Dunn, who had two 100-yard returns against Cal and another against Washington State to provide the winning highlight. Dunn also had one against Iowa State in 2010. He now owns or is tied for five NCAA kickoff return records. He ranks first in kickoff returns for a touchdown in a season (four), 100-yard kickoff returns for touchdowns in a career (five), 100-yard kickoff returns in a game (two against Cal) and kick return average in a game (74.0 versus Cal). He is tied for the NCAA record for kick return touchdowns in a game from any distance (two against Cal). "It was unbelievable," Dunn said. "The last game of my collegiate career, to end the game that way was unbelievable." Whittingham, who said he was surprised by a lot of things in the game, said he was shocked Dunn had a chance at a return. "We were getting the ball and I thought we had some momentum on offense, but it turned out to be a non-factor because we took the kickoff to the house." 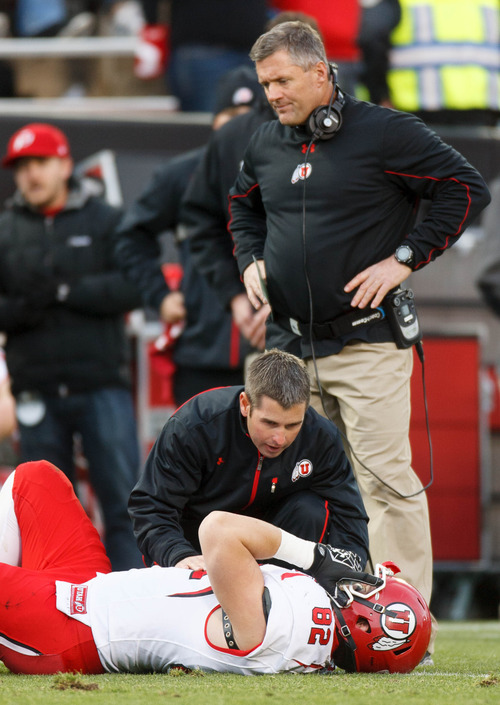 The wild fourth-quarter dramatics saved what otherwise could have been a humiliating loss for the Utes. Playing against arguably one of the worst teams in college football, Utah&apos;s offense struggled and finished with just 336 yards, 168 of which were gained by running back John White on 20 carries. White&apos;s efforts gave him 1,041 yards for the season, making him the first back to rush for 1,000 yards in back-to-back seasons. 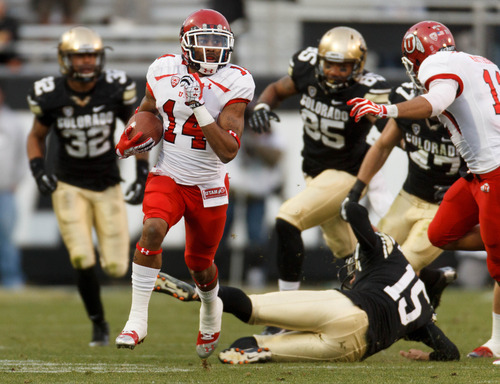 While Utah&apos;s offense struggled outside of White&apos;s efforts, Utah&apos;s defense had its own problems. The Utes came away with four interceptions but still gave up 306 yards passing to a team that was managing just 182 per game for the season. 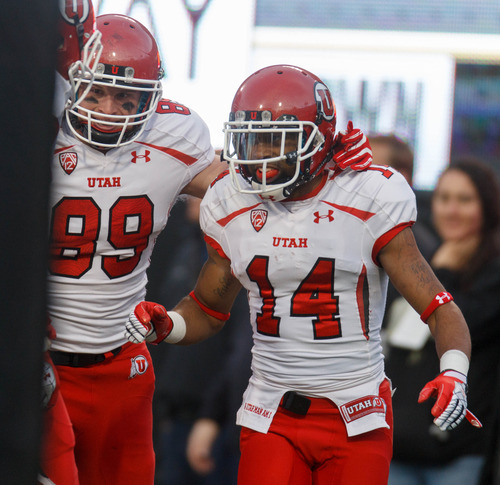 Fortunately for the Utes, Dunn was there to save the day. "It was a mixed bag, but we did come away with a win," Whittingham said. "I&apos;m very happy for these seniors to come away with a win." 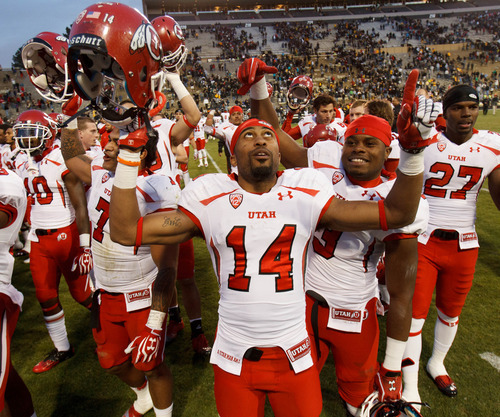 The Utes now must wait to see if they are lucky enough to go to a bowl game. If enough teams aren&apos;t eligible to fill the 35 bowls, the five teams with the highest Academic Progress Rates will be placed in a pool, and bowls will have their pick of the teams they want. The Utes, who have an APR of No. 33, would likely be in that mix. R Colorado&apos;s hope of tying the game ends with a Brian Blechen interception at Utah&apos;s 34-yard line with 37 seconds remaining.